If you had asked me a few years ago whether I would ever consider swimming three miles in Lake Michigan, I would have winced. Sure, I’m a strong swimmer after years of childhood and college competition, but having retired from swimming 20 years ago, I was out of shape and felt like that part of my identity was gone. Besides, open water swimming has always scared me — creepy underwater plants, potentially predatory marine mammals roaming below the surface and, of course, the dangers of the fickle water. I prefer the banality of a well-lit chlorinated pool. Or I thought I did. Chicago’s Big Shoulders Open Water Classic takes place each year in Lake Michigan on the first Saturday after Labor Day. It’s one of the premier open water races in the United States and draws participants from across the nation. If you were walking around the city on race weekend, you may have spotted some of them. They were the ones with goggle tan lines, hydration packs, Garmin watches and, befittingly, big shoulders. The Big Shoulders race course follows a triangular path between Ohio Street Beach, the Lakefront path and two large seawalls. The Big Shoulders race is so popular, it sells out within two days, and for good reason. 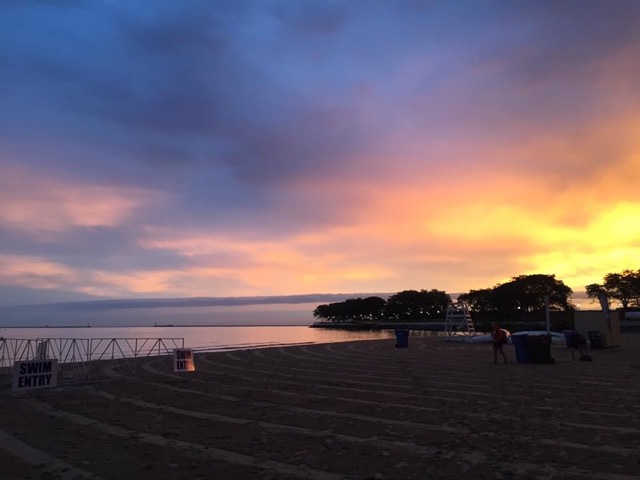 The event is exceptionally well run by veteran race director Chris Sheean, and the course is both beautiful and grueling: a 2.5-kilometer triangular route situated at the base of the city skyline at Ohio Street Beach, one of Chicago’s many gems. To start, the swimmers wade 20 yards into waist-high water. 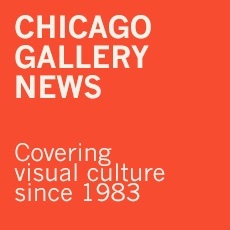 At the sound of the horn, they swim out toward the seawall, turn back toward the shore, but aiming for a point much further north than where they started, and then swim parallel to the lakefront path and back to the start. Swimmers who want double the fun (or double the pain, depending on your view) take a second lap to complete the 5-kilometer, or 3.1-mile, course. 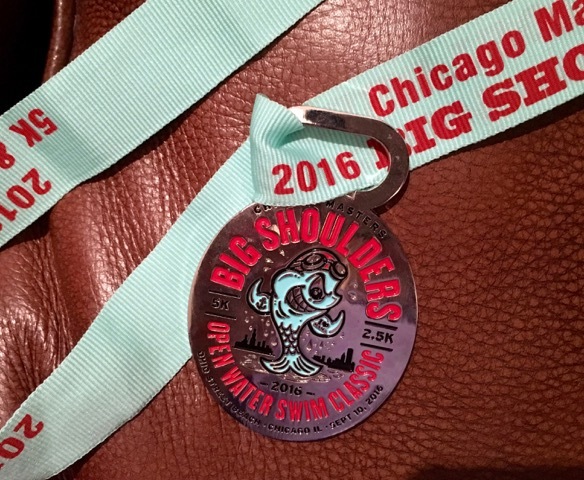 After getting myself back into decent swimming shape and then mustering up the courage to take on the challenge, I decided to try Big Shoulders, and I opted for the longer race. Breathtaking view of the skyline from perspective of swimmers mid-race. 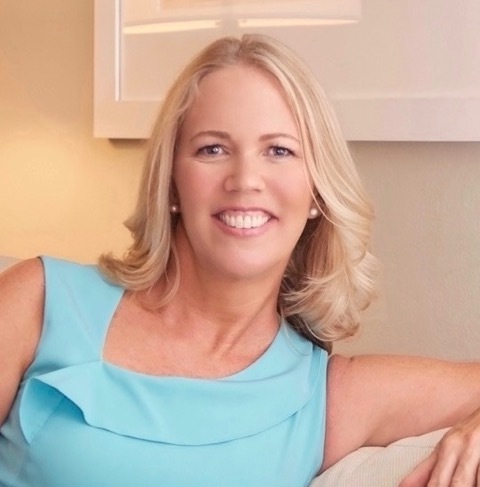 When I first learned that I had gotten a spot in the race, I felt lucky and thrilled. And then nausea set in. 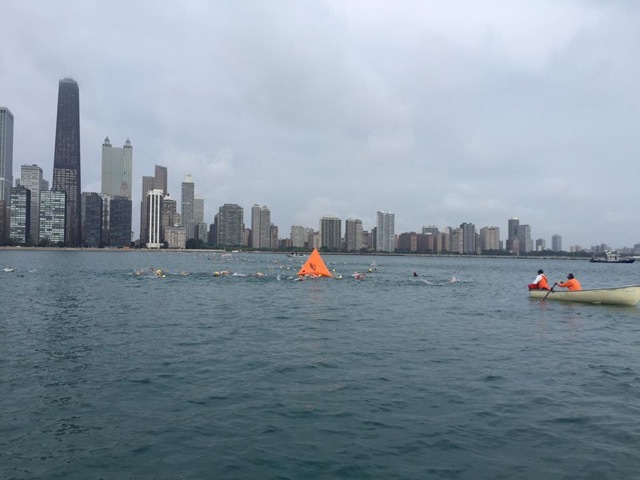 I would be one of 1,200 swimmers thrown into unpredictable lake conditions that could range from water temperatures in the high 50s to low 70s; from warm, sunny skies to cold, heavy rains; from calm waters to perilous chop. Some years, the water is friendly and flat as a mirror, although this is rare. 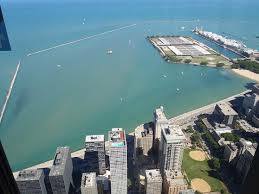 In 2012, the lake was choppy and rough, with currents that seemed to push the swimmers backwards. As last year’s race approached, a huge storm produced sheets of rain, high winds and 8- to 9-foot waves that crashed over the seawall. The race, which was celebrating its 25th year, was canceled for safety. On the eve of this year’s race, the course conditions were still unknown. The forecast called for a 60 percent chance of isolated thunderstorms, but as Chicagoans know, weather here can surprise. Race participants went to bed not knowing what the morning would bring, but I visualized my race in preparation and hoped for the best. The glorious sunrise, warm and breezy weather, and blue waters made Ohio Street Beach feel the like the Caribbean. It turned out that race morning was glorious: sunny, warm, breezy. The water was fairly calm and clear. As I walked under the Ohio Street tunnel and turned up the path to the beach, I almost felt as if transported to the Caribbean. Weather was only one concern, though. Jittery nerves clenched my stomach as I stood onshore listening to the race director’s safety briefing and searching the water for the bright orange 8-foot buoys that mark the course. The two far buoys looked so small in the distance. What if I can’t make it? I thought. What if my cap falls off and my hair covers my eyes so I can’t see, as happened in a previous swim? What if slimy seaweed drapes over my face? What if someone swims over me? What if I’m too slow or cramp up or want to quit halfway? What if… but then I put those thoughts away and switched to a warm-up routine grounded in affirmation. I was ready. I could do this. At the sound of the horn, we were off. The freshwater of Lake Michigan provides a home to more than 100 species of rare plants and animals, and that day more than 1,000 rare endurance athletes joined them. The water was surprisingly clear. As I took off, I could see the fine grains of sand a few feet below. Farther out, I swam into a school of small silvery speedy fish. A quarter mile farther, I came upon a garden of tall, submerged plants rooted 15 feet to the bottom. Their stems and leaves grew up toward the surface, and if I reached down far enough, I could have touched them. The plants danced a little to our waves. It felt like an enchanted underwater forest. 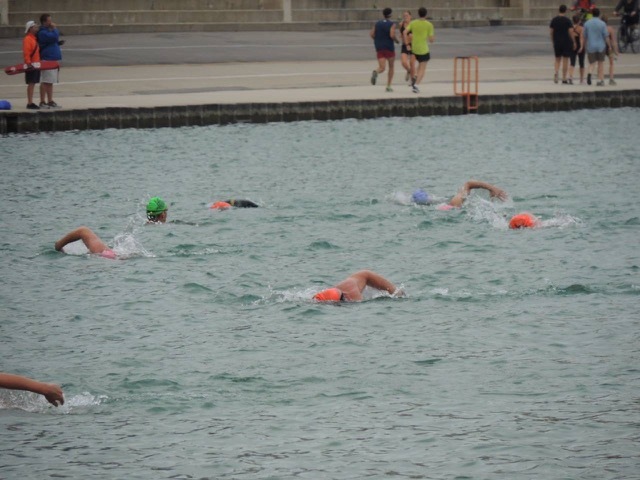 The only other water life I saw were my fellow racers churning through the water in a beautiful symphony of athleticism. As we turned at the far buoy, we encountered some choppy waves, which broke my meditative spell. Adrenaline kicked in. I swam with more effort, and although it felt like I wasn’t going anywhere, I imagined my body was a rowboat, my arms the paddles, and I powered through the waves. I gained confidence at the halfway point of the race and tried to pick up the pace. I started to draft off another swimmer, and soon enough saw someone drafting off me and imagined us as a long train snaking through the water. There’s a joy in being part of a race, fitting into the rhythm of the group. For a time, it was enough to just be a participant. On the home stretch, though, the competitive nature that drove me to swim at Stanford kicked in. I put my head down and turned up the speed, breaking from the group and powering home. As we neared shore, I kicked harder, trying to get blood flow to my legs, in preparation for the sand run at the finish. Apparently, I didn’t kick hard or long enough. I struggled on rubbery legs to climb up the soft, wet sand and fell flat on my face just steps from the finish line. Spectators “oooohhhed” when I fell but clapped loudly when I rose to my feet and crossed the timing mat. Still red in the face, an odd mixture of exhaustion and embarrassment, I found myself shaking hands with the race director, who offered a huge smile. I don’t know whether the smile was part of his congratulations to every swimmer or a special gesture for my rookie fall in the sand. I didn’t stop to ask. Up ahead stood a young, smiling UIC swim team-volunteer who helped me peel off my Velcro timing chip and draped me with a medal. My face may have still been red, but now it held a proud glow as well. 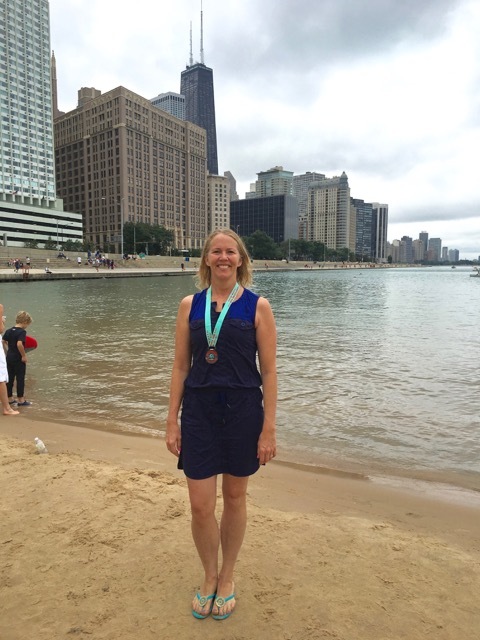 Conquering fear, braving Lake Michigan and sporting a handsome medal made for a perfect Big Shoulders experience. This entry was posted in At Your Best on September 25, 2016 by Kay Whitfield.